Jungle Red Writers: Runaway Bride, Murder Victim or Hero? 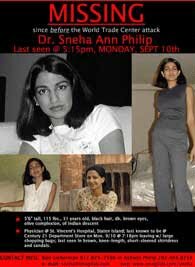 ROSEMARY: I first heard about Dr. Sneha Anne Phillip a few days after 9/11. She was my friend's doctor and she was missing, believed to have been a victim of the World Trade Center attack. Like thousands of others her distraught husband put up flyers and searched hospitals until the worst possible news became reality. No survivors would be found. Over time more details emerged and it was discovered that Sneha had actually been missing since the evening of September 10. Her doctor husband believed suggesting she was a 9/11 victim was the only way anyone would care about what happened to one woman in the aftermath of the terrorist attacks and the only way anyone would look for her. He was probably right. An investigation into her disappearance by the New York Police Department revealed a very different possibility as evidence of a double life including drugs, alcohol abuse, a troubled marriage and a sexually adventurous lifestyle suggested it was equally possible she may have intentionally disappeared or been murdered by someone she met on her frequent nights out. What does my friend think? He's Scottish so he doesn't reveal much, but I was reminded of a conversation not long before 9/11 when he told me his doctor had flirted with him rather aggressively. No evidence has ever been found of her having perished in the Towers, but that's also the case with many other known victims. And there's nothing that prevents someone from behaving heroically even if their previous history might suggest otherwise. From time to time articles appear in local papers and magazines, but the mystery remains. For her sake I hope she ran away - but then I'm an optimist. Today's music quiz - "...and you're sorry for what you've done..you should never been playing with a gun..." Guess the song title and artist and you'll win a signed copy of Dead Head. Don't send JJ the book. He cheated. And hey, that doctor sounds like quite a character. I hope she ran away, too, but I'll bet she was helping someone close to the towers. I had a feeling you'd get this one! Complicated story about this doctor. Rosemary, what a great premise for a book--you write about it well, maybe it's in your future? Yay, Donna! Send your snail mail addy to rosemary@rosemaryharris.com and I'll send you your free book! Roberta, I did have a notion to write something inspired by this story, but there have alreayd been a few articles and newsmagazines features on her and - in The Emperor's Children Claire Messud has a character who disappears himself by pretending to die at the Trade center. Trade Center stuff is hard for me...a good friend was a firefighter. We were supposed to get together that Tuesday morning to work out and he called me to cancel. He survived but lost many friends. This woman's story has fascinated me for years - the whole shadowy life that her husband and family knew nothing about. This is one of those real life events that makes an author blink and immediately start plotting a novel. A woman who uses the cover of a terrible disaster to walk away from one life and make a new one? Or a killer covering up murder in a mountain of bodies? And I just realized I know two books which have taken those storylines: LEARNING TO FLY by April Henry and ONE CORPSE TOO MANY by Ellis Peters. And there's a play..called...ah, I know this but I can't remember..anyone, anyone? Where two people who work at the WTC are having an affair, and are not at work the day of the bombing. Do they pretend to be dead? I remember, when I saw it, thinking it was a turning point that such a play could even be produced. I am fascinated by stories like this. I'd love to use one as a springboard for a book sometime. But I really feel for the husband. He'll never have closure and spend his life wondering and worrying. Sad story, but my first thought was to suspect the husband. But then I'm suspicious that way, even though I usually argue that investigators too often narrow the scope by focusing *just* on the spouse. Intriguing incident, whatever the case! This puts me in mind a little of Sue Miller's fabulous novel, "The Lake Shore Limited." The brother of one character, the boyfriend of another, is killed on 9/11 when his plane strikes the Towers. The girlfriend had been planning to leave him and deals with the resulting mess of emotions by writing a play featuring a similar scenario. Sounds grim, I know, but it's not. A great reminder of the uniquenss of each story and response to disaster. Oh, Leslie, that book is in my TBR pile! Thanks! Video evidence is really needed in these types of cases. If she was indeed a victim of a crime, it will be hard to prove because the World Trade Center attacks has been a convenient cover to dissuade most people from following up on the case.